» Why Does It Take So Long To Hear Back From An Interview? Why Does It Take So Long To Hear Back From An Interview? You went on an interview, waited anxiously by the phone for three days… and nothing. No response. 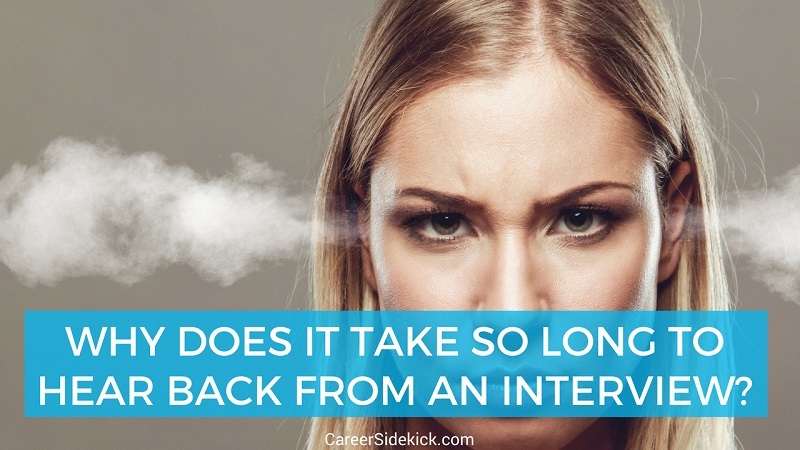 So why does it take so long to hear back from an interview? Well, there are a couple of reasons that I’ll cover in this article. And the good news is this: Most of the reasons *don’t* mean you did something wrong or that you’re out of the running for the job. You just need to know how to handle it. So take a deep breath, and we’ll go through the likely reasons you haven’t heard feedback from an interview yet. Why Does It Take So Long To Hear Back After An Interview? Even if everything goes right in terms of the process, it takes at least a couple of days, or up to a week to hear feedback after your interview. Any less, and you’re lucky. Why? People in the company need to get together, compare notes and discuss your interview after. Even if just one person met with you, they’ll probably share their thoughts with their team, their boss, HR, etc. And they need to compare you against the other candidates they’re considering. So it always takes some time to do that too. But like I mentioned earlier, there are a whole lot of reasons that DON’T mean you’re out of the running for the job. Not at all. So let’s look at those because there’s a really good chance the company might still be interested if you play your cards right and follow up properly. You might have been the first person they spoke to, and they’ve scheduled five others. It’s not fun, but it happens. And it means you’ll have to wait a couple of weeks to hear back after the interview most likely. It’s one of the best questions to ask the interviewer because it’ll remove a lot of stress and anxiety after the interview. If you know they have to speak to five other people, you’re not going to be sitting by the phone the next day wondering why they haven’t called you yet. And if just one of these people is out of the office or on vacation, it can slow the whole process down and result in it taking longer to hear back from an interview. This is one of the reasons I say summer is not one of the best times to look for a job… because a lot more people go on vacation. Usually the hiring manager and other team members have a lot going on besides hiring. They’re building products, making the company money, saving the company money, or any number of other things. But remember it’s probably not the top priority for them. It’s just one piece of their duties. So they will have no problem delaying a decision, postponing an interview, or putting a job opening on hold for weeks or even months if the group has too much going on! Even if they already started the process with you. They can’t always predict what will come up in terms of work and deadlines, so that’s why this happens. Sometimes companies decide they don’t need to hire someone right now, or they’re too busy to do it (for reasons mentioned in #3 above). So they put the position on hold indefinitely. It doesn’t mean they didn’t like you, it just means they can’t hire anyone right now. Sometimes budgets get cut too. Or they open another position that’s more crucial. For example sometimes when a company needs a new Manager, they decide to hire that Manager first, and then let the Manager hire other team members. This is another good reason to follow up instead of assuming they’re not interested. Sometimes things get lost in the shuffle. The greatest risk of this happening is when you initially submit your resume, but it can happen after the interview too. Maybe there’s a new HR person who lost track of needing to schedule the next steps with you. Maybe the hiring manager thought he sent you an email with feedback but never actually sent it. There’s an art to following up for feedback and keeping in touch after your interview. I recommend this article for exactly how and when to follow to make sure you’re asking for feedback in the right way. In general, you’ll want to be clear/direct in asking for an update – don’t be timid or shy. But also don’t act impatient or rude. If they say things are delayed or they’re still deciding, you can’t respond negatively. Trying to rush them or showing a negative reaction is a mistake that will cost you the job. Just mark your calendar to follow up again in a week or two to ask for updates again. The longer it takes to hear back after an interview, the less likely it is that you’ll be receiving good news. So while it’s always possible you’ll receive the job offer after waiting a few weeks, you should really keep applying for more jobs and lining up more interviews. You can’t change the fact that it often takes a long time to hear back after an interview, but you can control how many jobs you apply for. Focus on what you can control and go out and get more interviews while waiting! That’s how to get a job offer in less time!